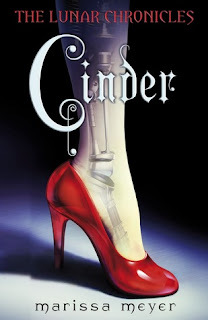 Cinder is basically a dystopian version of the classic Cinderella. Based in New Bejing (which is basically the current Bejing, just not destroyed due to World War IV) the story follows Cinder, an orphaned cyborg who lives with her stepmother and two stepsisters. Needless to say, they're no the nicest of people (though one of the sisters is). After a range of different problems, Cinder's stepmother drafts her to be a test subject to cure the worldwide disease of leutomosis. However, a lot of Cinder's past has been has been left behind closed doors, and with the help of Dr Erland and Prince Kai, and the ever-present threat of Queen Levana, those ghosts are discovered. Now as I hinted at earlier, the first couple of chapters were quite boring and slow. There was a lot of setting the scene, and things happened to several different characters, but you didn't know them well enough to really sympathize with the situation. However, this did change about a quarter in, and from then on out I was addicted. There was constant suspense - what was Cinder? Did Prince Kai like her? Will she go to the ball? Will so-and-so survive? Will they find a cure? Is Princess Selene alive? There is always more to find out, and Meyer found the perfect balance between keeping a few secrets from the reader to keep them hooked, but also letting a few things slip to keep them satisfied. It's hard to perfect that style of writing, but she's done it. I also adored the main characters of Cinder, Kai, Erland, Levana, and Iko. They each had very different personalities, but I thought that putting all those attitudes together created quite an interesting setting. There were so many different dynamics going on that it was genuinely believable. I find that some authors create different characters, but they are all quite similar. This was definitely not the case. I also liked the fact that although Cinderella is typically the damsel in distress, Cinder wasn't - she wasn't annoying, or dependent on others, or one of those heroine's that constantly goes on about not being pretty, when she obviously is. She was normal - well, as normal as a future cyborg can be. She was likable and despite the era and physical differences, I found her quite relateable, which made the story more accessible. I'd definitely recommend this book. Lately, a lot of different authors seem to be moving from the vampire genre and going into dystopian - and unfortunately, some of them aren't that great. But Cinder definitely is. It's original, it's well-written, and it's gripping. I love fairytale retellings, and I loved this take on it. It's technology meets corsets and hoop skirts, and I cannot wait for the next installment to the Lunar series.